Buy a wonderful company at a fair price. Competitive Advantages of over 600+ SGX-listed companies derived systematically through a scorecard system and see how they rank. Imagine 66 years after it IPO, you discover that Coca Cola is an amazing company. So you invested $10,000 in 1985 and left it alone. That would be worth $588,044 today, an annual return of 13.32% with dividends reinvested. • In short term, stock prices fluctuate because of emotions. • In long term (1 year or more), stock prices increase is due to the returns (profits) a company can earn. Coca Cola had the ability to sustain high returns over a long period of time, allowing the value of the company to compound. The secret to this ability? Having an economic moat. An economic moat protects a company’s returns from competitors. For the first time, we have created a scorecard that allows users to easily measure, rate, rank and compare a moat. Find high quality, superior companies easily for investment. And by that, we mean companies with huge returns of 50% and above in long run. Take a look at our back test. 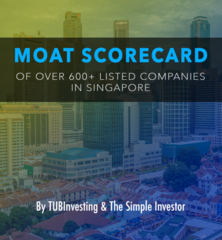 A back test of 650+ stocks in SGX shows that the average total return for moat score over 70 is 75% over 5 years, and a shocking 200%+ for companies with moat score over 80. A further back test of our moat rating shows a clear trend – A high moat score increases the chances of picking a company with positive total returns over 3 and 5 years. 1. Don’t worry about bottom picking. Is the stock market up? Down? The moat scorecard allows you to ignore market noise, find the best companies and buy them at a fair price. Moat scorecard simplifies the process of spotting amazing companies and lets users avoid those with fundamental problems. No complicated chart reading or looking at confusing ratios. How does one compare an airline with an F&B? Moat rating allows investors to compare across 24 industry and 39 sectors in SGX. We believe investors should head for the highest long term returns, no matter the industry. Investors that overpay for growth story must wait for years to see a return. We prefer stocks that are already worth what they can produce now. Use our conservative price to estimate what is a good price. Buy wonderful companies at a fair price with the Moat Scorecard. Subsequent investments resulted in more hits than misses, giving him the confidence to declare that he has found his own unique way of investing. Currently, his investment methods has evolved significantly. He uses a few different methods to invest. However, all these methods are always centred around value-investing concepts and fundamental analysis. He is the veteran blogger behind the popular blog, tubinvesting.blogspot.com. As a business owner, Simple Investor SG’s investment style is heavily influenced by Warren Buffett. He viewed the stock market as a place for him to acquire good business when they become irrationally priced by the market. He is also a firm believer that anyone can invest, as long as they acquire the right knowledge and mindset. The materials and analysis presented to the subscribers are purely providers' opinions and views. Any views, opinions, references or other statements or facts provided to the subscriber are personal views and are not supported, sanctioned or endorsed in any way. The materials are provided for information purposes only and is not intended to or nor will it create/induce the creation of any binding legal relations. It does not constitute an investment advice, an offer or solicitation to subscribe for, purchase or sell the investment product(s) mentioned herein. It does not have any regard to your specific investment objectives, financial situation and any of your particular needs. Accordingly, no warranty whatsoever is given and no liability whatsoever is accepted for any loss arising whether directly or indirectly as a result of this information. Investments are subject to investment risks including possible loss of the principal amount invested.